In a monologue considered witty by teenagers, teenagers in adult bodies and those who hate President Trump, CBS "Late Show" host Stephen Colbert said about President Trump, "The only thing your mouth is good for is being Vladimir Putin's c*** holster," and "You're turning into a real prick-tator." Not to many of us. And not just not witty but obscene, which is particularly disturbing because it was broadcast on network television, not cable television. But more than anything, it exemplified a trend in American life that one could identify without any exaggeration as the unraveling of civil society. To anyone -- liberal or conservative -- who grew up watching Johnny Carson on late-night TV, the descent from Carson to Colbert is as breathtaking as it is heartbreaking. Along with virtually every other American, I never knew Johnny Carson's politics. I would not have been surprised if he was a liberal or a conservative, a Democrat or a Republican. In his 30 years as host of "The Tonight Show" on NBC, he never so much as hinted as to how he identified politically. He poked fun at whoever was in power. The reason he didn't let on where he stood politically is he believed that he had a much greater responsibility: to offer Americans of all political persuasions an island of good-natured fun, a place where all Americans could laugh together every night. And, of course, it is inconceivable that he would have used the language Colbert used. Kids could watch "The Tonight Show" because he -- and we -- lived in a pre-left age, when grown-ups thought they had a responsibility to be good models to young people -- in other words, a responsibility to be adults. But the left has never been comfortable with growing up. Those who mock the Trump motto, "Make America Great Again," who claim they don't understand how anyone could think America was ever great, might begin to understand what many of us mean, in at least this one way: Prior to the Age of the Left, during which we have lived since the mid-1960s, there were places in America where Americans could enjoy life and one another without politics intruding, not to mention hate-filled politics like Colbert's. Americans could watch sports events without athletes showing contempt for the American flag and the national anthem; without sportscasters and sports writers labeling as racist anyone who used the team name "Redskins"; without sports shows injecting politics into their programing, as ESPN does now so often that many sports fans no longer watch it. It was an America where elementary teachers referred to their students as "boys and girls." Today, teachers in more and more states are directed not to use those terms, as some 6-year-old may not identify as a boy or a girl. It was an America where kids were proud of the American flag. Today, in the Age of the Left, students on a growing number of American campuses vote to have the flag removed from their campus because in their view, it symbolizes not freedom and sacrifice but slavery, oppression and imperialism -- ideas put into their heads by leftist high school teachers and college professors. And it was an America in which Superman's self-proclaimed mission was "truth, justice and the American way." A few years ago, however, Superman announced that he was renouncing his American citizenship to become a "world citizen." One could list a hundred ways America was indeed great (without ever ignoring serious moral flaws). Now, one can list a hundred ways in which America has lost that greatness. The descent from Johnny Carson to Stephen Colbert is just one example. But it is a powerful one. And it is but one more result of perhaps the most important rule of life of the past 100 years in America and around the world: Whatever the left touches, it ruins. The universities, the news media, the entertainment media, the fine arts, the courts, the high schools and the elementary schools (and soon, the preschools -- once they're government-funded and universal) -- all ruined wherever leftism has achieved dominance. 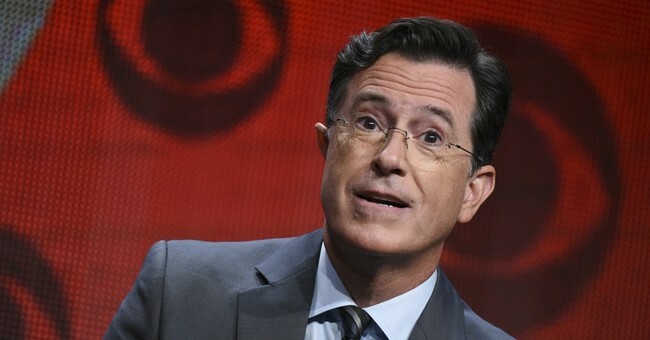 Now it is the turn of late-night TV as embodied by Stephen Colbert. Or, as he himself put it on election night on Showtime, "I'm your host, Stephen f------ Colbert."